Glitters Film & Media Academy (GFA), focusing in the area of Media and entertainment courses since 2001 has added a new dimension to its portfolio. 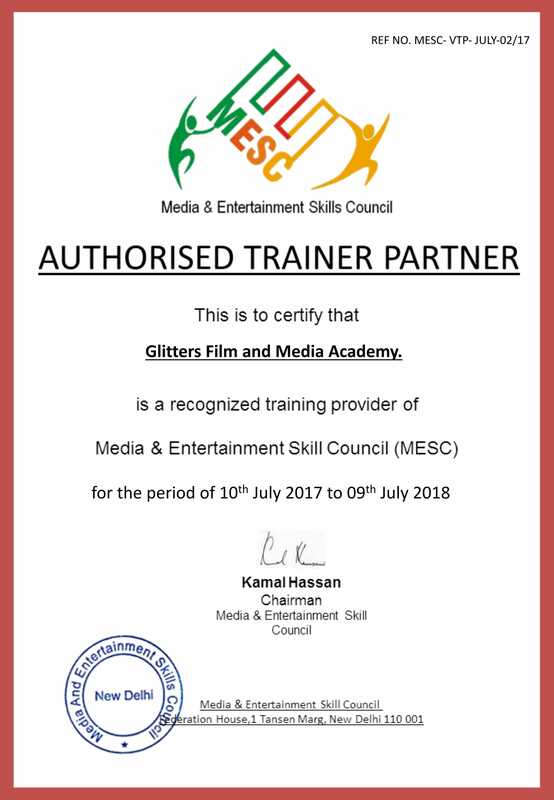 GFA is now officially a Media & Entertainment Skill Council of India (MESC) affiliated partner! MESC has been set up under the National Skills Development Mission, Government of India under the aegis of the National Skills Development Corporation (NSDC) and promoted by FICCI. The Ministry aims to ‘skill’ on a large scale with the speed at the national level, at the same time, maintaining high standards in order to achieve its vision of a ‘Skilled India’, which is very much under the prime focus of our PM Shri Narendra Modi. For GFA, this is indeed a forward-looking step, which it has taken with pride. As a training provider, certain courses offered by GFA in Media and ENTERTAINMENT can now be assessed and certified by MESC. Students participating in the courses will also receive internship training, which will gear them for a career in the industry. MR Deepak Baldev Thakur Chairman at Gfa delightedly said, “GFA has always stood for providing an education that promotes employability. It is a very good opportunity for us; our joint efforts will definitely help students in finding good internship offers and placements in the reputed organizations”.